'I Relied Upon My Faith,' George W. Bush Tells Jay Leno : The Two-Way The nation's 43rd president made a rare appearance on national TV. Told that he looks more relaxed now than when he was in the White House, Bush laughed and said, "No kidding ... duh!" Making a relatively rare appearance on national TV, former President George W. Bush told Tonight Show host Jay Leno on Tuesday's show that "I relied upon my faith, my family helped a lot and I had a good team around me" while in the White House. Bush also repeated some things he's said before — that he doesn't miss being president and that he'll leave it up to history to judge his performance. The nation's 43rd president also had some funny moments: "You look much more relaxed" now, Leno told him. "No kidding ... duh!" Bush said with a laugh and a comical look on his face. The show has posted several clips on its YouTube page. We'll embed one that includes some of the serious and not-so-serious parts of the discussion. Since leaving office, Bush has taken up painting. He gave Leno a portrait he's done of the Tonight Show host. 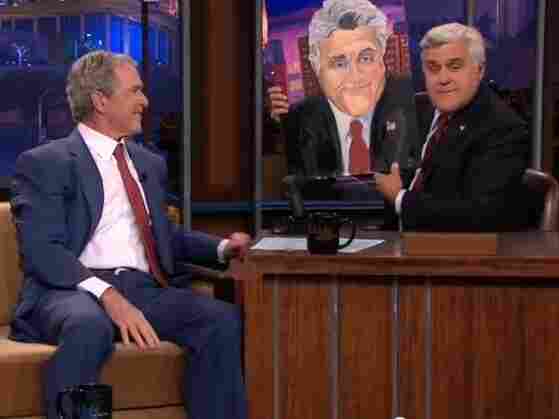 Former President George W. Bush gave Tonight Show host Jay Leno a painting Tuesday night. Since leaving the White House, Bush has taken up painting.